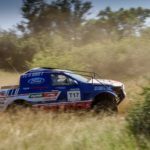 LICHTENBURG, South Africa, 1 April 2017 – The Ford Neil Woolridge Motorsport (SAC/NWM) Puma Lubricants team got its SA Cross Country Series (SACCS) campaign off to a solid start at the Lichtenburg 400, the opening round of the 2017 season this weekend in the North West province. 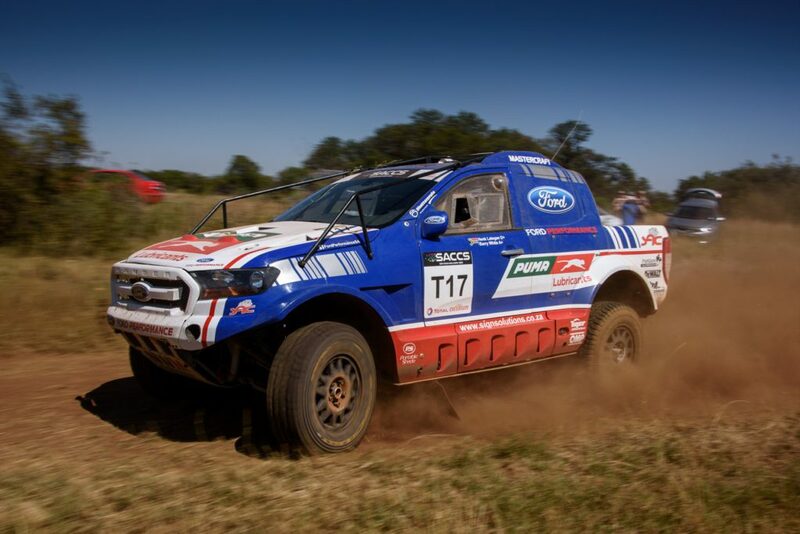 In extremely dusty and rocky conditions that covered a total race distance of over 400km and saw a high attrition rate and numerous punctures, Gareth Woolridge and co-driver Boyd Dreyer (T77) piloted their brand-new Puma Lubricants-liveried Ford Ranger to second in Class T.
New team-mates Henk Lategan and Barry White (T17) showed impressive pace in their debut cross country outing after making the switch from rallying, and were rewarded with the final podium place. 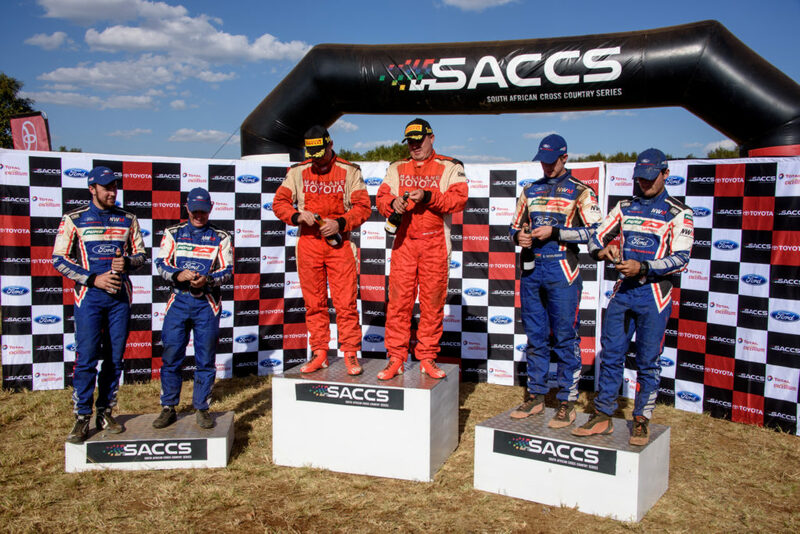 The experienced combination of Lance Woolridge and Ward Huxtable (T34) showed superb speed and tenacity throughout the weekend, but a series of punctures set them back, eventually ending sixth. 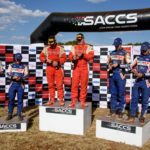 As the opening race of the 2017 SA Cross Country Series powered by Total, there was an air of excitement and anticipation at the start of the Lichtenburg 400 on Friday 31 March. 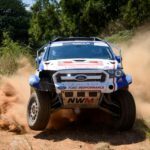 For the Ford NWM Puma Lubricants team, the squad of young and determined drivers were eager to get their championship underway. The Friday qualifying format for 2017 introduced a much shorter route than previous years, with the season-opener relying on a fast and smooth 49km prologue to determine the starting positions for the main race on Saturday. 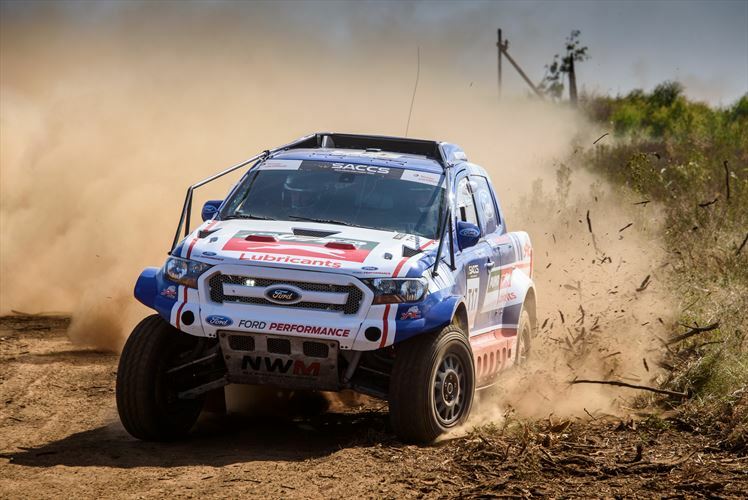 The sprint-style qualifying was dominated by the Ford Rangers, with Lance Woolridge and Ward Huxtable emerging fastest in Class T, with a time of 30 min 39 sec. 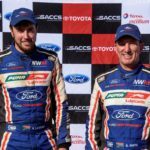 Younger brother Gareth and co-driver Boyd Dreyer were a scant 4 sec adrift, followed just 3 sec later by the Ford V8-powered VW Amarok of Hennie de Klerk and Rodney Burke. 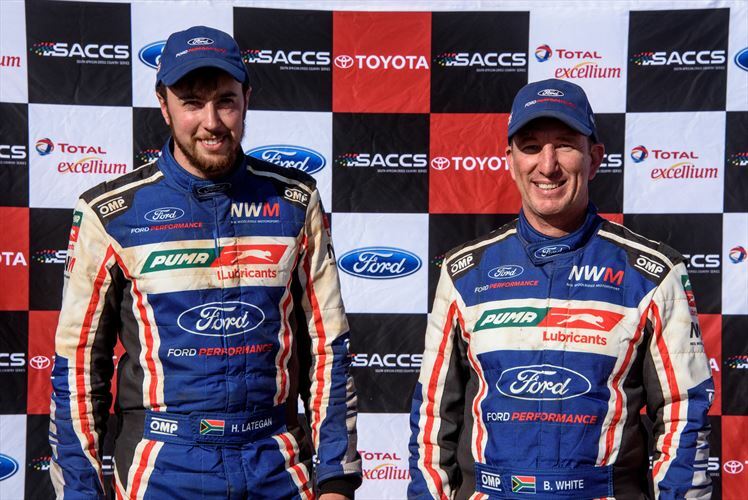 Former rally stars Henk Lategan and Barry White were right on the pace from the start, matching the time of De Klerk and Burke, despite this being their first official outing in the Ford SAC/NWM Puma Lubricants Ranger. The route director had warned the competitors that the 178km main race loop would be treacherous and rocky, and so it proved, with most of the top teams suffering a series of punctures. 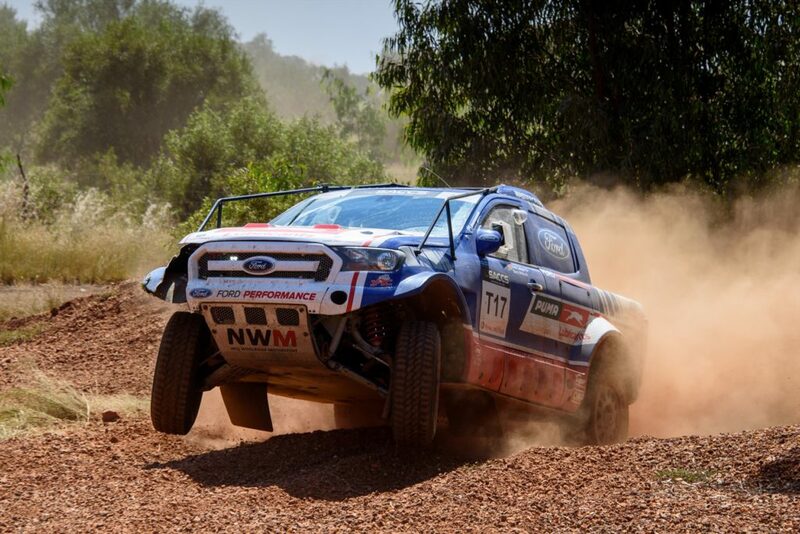 The driving conditions were made even more challenging with day’s ambient temperature reaching around 35 deg C by mid-morning, while a lack of wind saw heavy dust hugging the race route, which made the going extremely tricky for the crews. 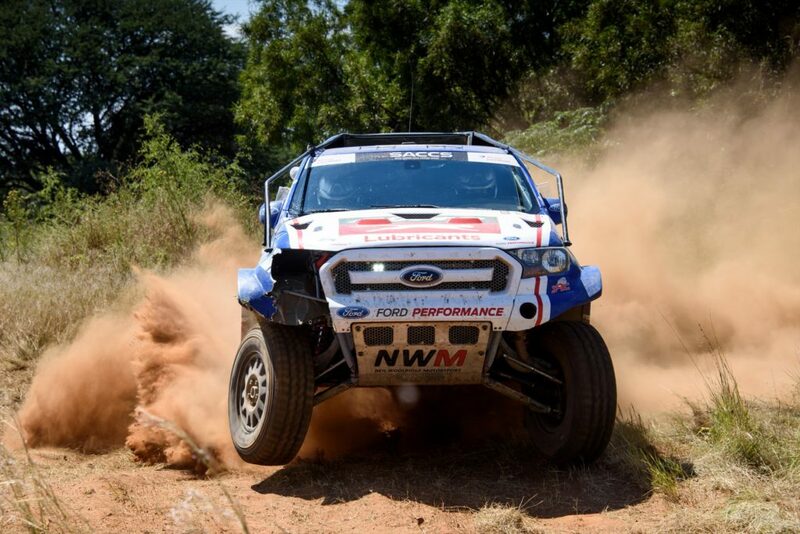 Lance and Ward were the first Class T competitors to set off, and were the first of the Ford Rangers to pick up a puncture, just 60km into the first loop when they caught up to the faster FIA-category Toyota Hilux of Giniel de Villiers/Dennis Murphy. 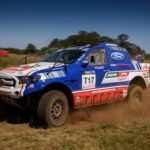 This allowed the VW Amarok crew past, and once back on the road again, they quickly made up time but landed up in the thick dust of the crew ahead before De Klerk and Burke too encountered a puncture later in the stage. 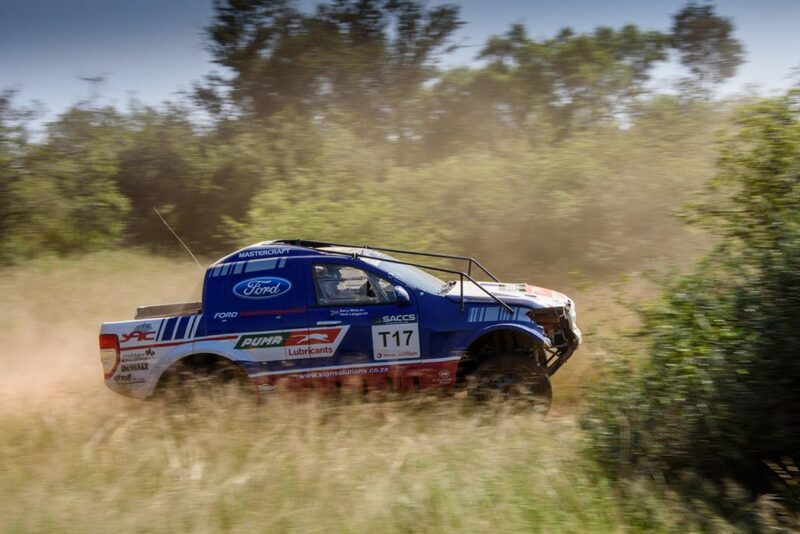 Gareth and Boyd also picked up a flat tyre around 40km into loop one, giving Henk and Barry the opportunity to gain a place and take the effective lead, with all three Ford Rangers running line astern and covered by mere seconds for the return section of the route. 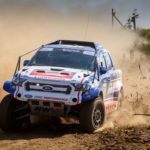 A second puncture just 10km from the end of the loop brought Lance and Ward to a halt, and they were further frustrated when the jack failed, dropping them further down the running order leading into the mandatory 20 min service at the Lichtenburg showgrounds. Having enjoyed a clean run on loop one, Henk and Barry also succumbed to the rocky conditions and incurred a puncture in the first half of loop two, giving Gareth and Boyd the chance to gain a place, with the latter duo enjoying a hassle-free run to the finish. They crossed the line second in Class T behind the Malalane Toyota crew of Johan and Werner Horn who, remarkably, completed the race without a single tyre failure. Meanwhile Henk and Barry suffered another setback just 5km from the end when the left front tyre was destroyed by a pole knocked into the road by another competitor. Nevertheless, they earned an impressive third in Class T, which is an exceptional result in their first-ever cross country race. 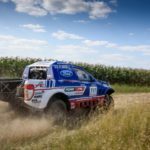 Although they didn’t have any punctures on the second loop, Lance and Ward’s frustrations continued when one of the wheels starting coming loose during the second loop. 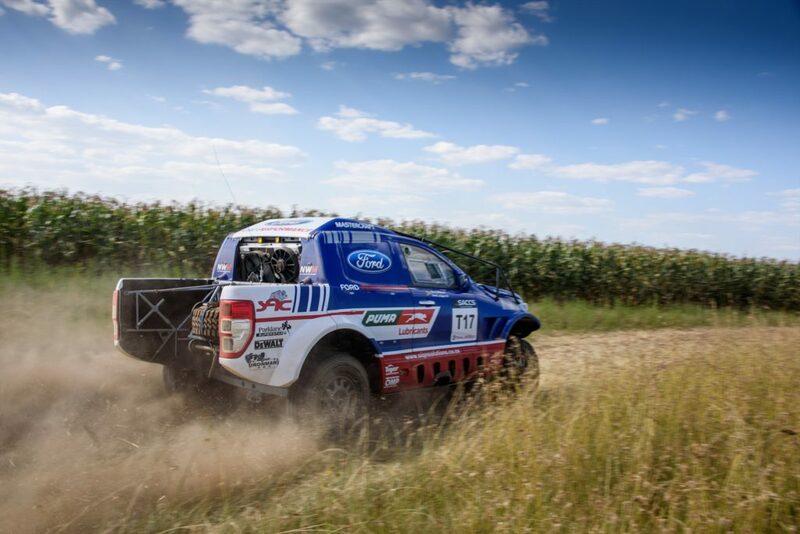 After stopping to tighten the wheel nuts, they adopted a cautious approach for the remainder of the race and crossed the finish line sixth overall. “I’m quite surprised to end my first race with third place. Before this I really didn’t know what to expect, and the race was a lot rougher than I’m used to in rallying. The pace was actually much quicker than I thought it would be. 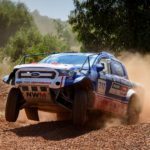 “At the beginning our focus was just on getting through the race, and then we found that our pace was decent and we were quite comfortable with the way the first loop went. Obviously, we had a couple of punctures in the second loop, but I’m really happy with third place. The next event is the Battlefields Dundee race in KwaZulu-Natal, on 12 and 13 May.